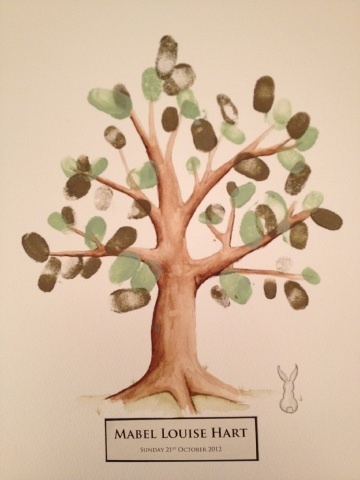 I first came across fingerprint tree guest books a year or so ago when doing some intensive googling for a friend’s wedding. While she was not too taken with then, I thought they were divine. 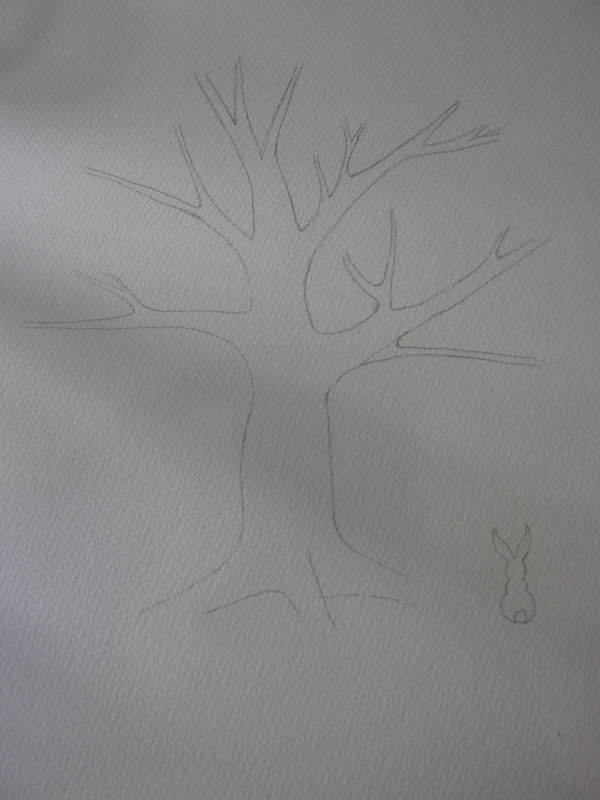 So, when Bex starting planning M’s christening, I suggested that it might be a nice idea as a kind of wish tree, with everyone making a wish for M with each fingerprint. I did some more searching on t’internet to get some ideas. There are so many options and variations out there! You can pretty much make the finger prints take any form with a little carefully planned guidance. But, I kept coming back to the tree. The tree needed to be just right and I knew exactly how I wanted it to look. 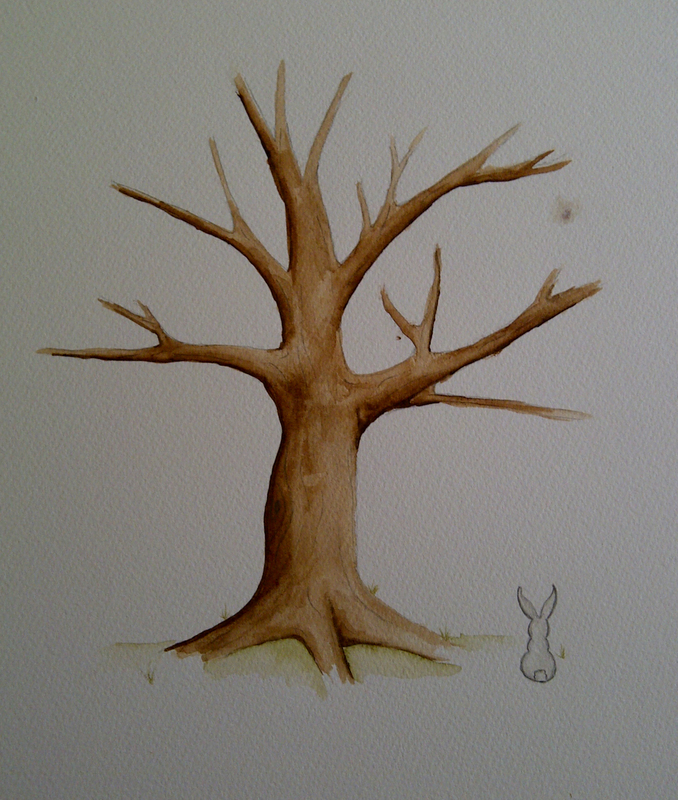 My inspiration was a tree near home that I love. It sounds weird, it’s dead and just sits in the middle of field by the canal looking out towards the Brecon Beacons. But it’s really lovely; all twisty and interesting. I have a lot of pictures in my head of how I’d like things to turn out. They very rarely actually end up looking like them. Some turn out better, but many do not! I was nervous to see if I would actually produce something that I wasn’t embarrassed to show to Bex. This called for a trial run! Trial runs make me a little uneasy. I tend to be good at “winging” things. What then happens is, I do the trial run, love it, but when it comes to final version I mess it up. This is the main reason most things I make are one offs! I decided to take the plunge one Saturday afternoon. Out came my sketch book, pencils and watercolours and I started sketching it out and playing with the watercolours. It actually came together really quickly. Twenty mins later I was almost done! It was missing a little something, so I added the little bunny and some butterflies. I didn’t like the butterflies; they were clumsy and too easy to mess up. They would not be making their grand debut in the the final version. The draft was finished. I sent it to Bex and Nick to see if it was they had in mind and if they wanted anything changed or added or just thought it was awful! But they liked it. Phew! With just a few weeks until the Christening, the time came to do it for real. I was anxious, the trial run had gone well and this inevitably meant I would totally botch it up. But, I had to grasp the (craft) nettle and get on with it. I got all the bits and bobs again, laid them out – including the trial run – on the table and….. went and made a cup of tea! An hour of avoidance later I finally put pencil to paper. For once I took a calculated careful approach. I drew the outline, lightly and cautiously, I didn’t mess it up. Hurrah! All I could do now was go for it. I have no real technique for painting with watercolours so I just had to put load up the brush and hope for the best. I started with the darkest parts, where the tree would be in shadow. This was the hardest part for me as if that went wrong I’d have to start again. But it all went to plan. I started on the shading and a short time later it was all done. Added the bunny, some grass and stepped away. There was of course a mistake! 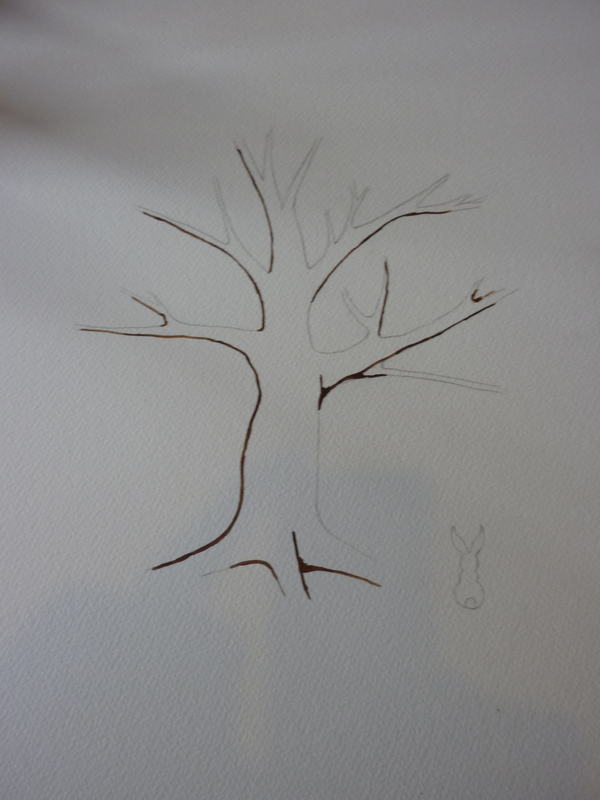 As I was finishing the tree I got paint on the side of my finger and smudged it near one of the branches. $@%*! Luckily where it was meant it could easily be covered with a finger print or two. We’d need inkpads for people to make their inky wishs. That could only mean a trip to the hallowed Hobbycraft! On our inaugural Harts and Carafts morning, Bex and I spent an hour and a half there and picked out the colours we liked – amongst other non-tree related items! Versamagic Chalk Inks in Hint of Pesto and Aloe Vera if you’re interested. Finally we printed off some simple instructions, got some paper scraps for test prints and M kindly donated a pack of her Huggies wipes to clean off leafy fingers. Then it was over to the guests. 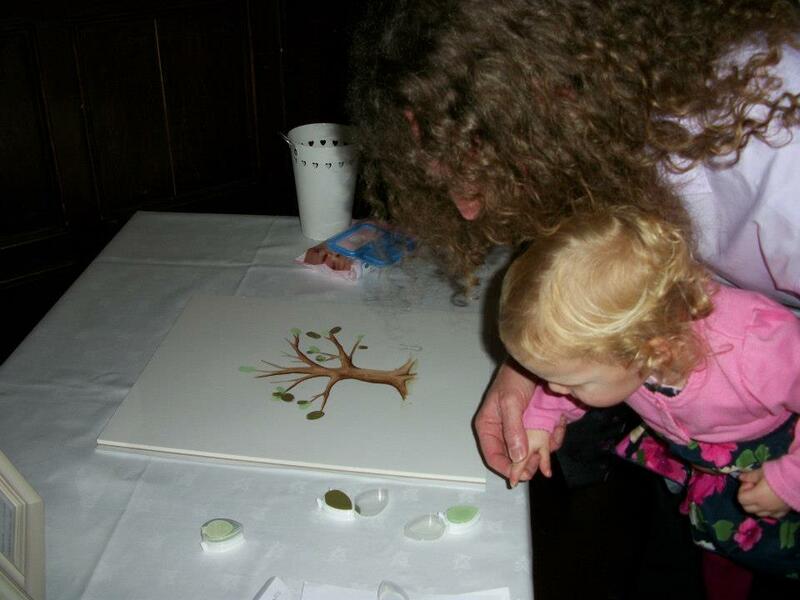 The last thing to do was add a little label with M’s name and the date of her Christening. And it was done, all ready to be framed. I hope she loves it as much as I loved making it for her and it’ll be remind her of what a special and loved little lady she is.